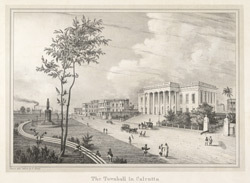 Uncoloured lithograph of The Town Hall in Calcutta by Frederick Fiebig dated c.1847. The Town Hall is situated in Esplanade Row beside Wellesley's Government House, designed in the Palladian style by John Garstin and completed in 1813. The Town Hall was used for meetings, official public functions and entertainments that had previously been held in the Old Court House. Opposite the Town Hall, we can see Richard Westmacott's statue of Sir William Cavendish-Bentinck, the Governor-General of India from 1833-1835. Fiebig also produced a 360 degree panorama of Calcutta in six parts in 1847 and he took many salt-print photographs of the city and its environs in 1851.